"There was an error compiling this function. 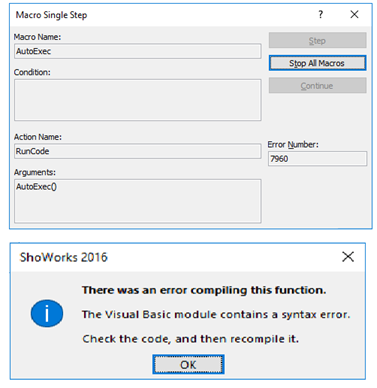 The Visual Basic module contains a syntax error..."
The machine running ShoWorks has an incompatible bit-version of Microsoft Office installed. This may occur on a machine that has never had ShoWorks sucessfully running on it, or on a machine that has recently updated/installed Microsoft Office with the incorrect bit-version. ShoWorks is compatible with all versions of Microsoft Office from 2010 through 2019 as long as they are the 32-bit (not 64-bit) versions. Note: Do not confuse Microsoft "Office" (must be 32-bit) with Microsoft "Windows" (must be 64-bit). Office is a suite of productivity applications like Word, Excel, Access and Windows is your operating system. Verifiy your version of Microsoft Office version by following the steps here: http://tinyurl.com/msoffice64bitcheck (you must have the 32-bit version and NOT the 64-bit version). If you are running 64-bit Office, proceed to the next step. Uninstall all Microsoft Office applications. Install Microsoft Office in the correct bit version (32-bit).